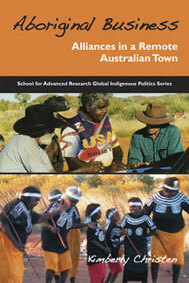 If you have the time or inclination to read only one book on Aboriginal affairs this year, I would strongly suggest that you pick up Kim Christen’s Aboriginal Business: alliances in a remote Australian town (SAR Press, 2008/Aboriginal Studies Press, 2009). Christen has been working with the Warumungu traditional owners around Tennant Creek for almost fifteen years now. She has helped them build the digital Mukurtu Archive of their history and culture, and was active in the planning and construction of the Nyinkka Nyunyu Cultural Centre. I was able to hear her lecture about both of these activities at the Kluge-Ruhe Aboriginal Art Collection in April 2008, and at the time she impressed me with her energy, enthusiasm, and multi-leveled appreciation for the lives and work of her Warumungu friends. In Aboriginal Business, she expands the scope of her investigations enormously, which is one reason to make this your top choice for this year’s reading list. In addition to addressing the “culture work” of the archives and cultural centre and the story of the production of a commercial CD of Warumungu women’s songs, Christen offers a history of settler-Indigenous relations and interactions in the Tennant Creek region, focusing especially on the time since it became the center of the last major gold rush in Australian history during the 1930s. Part of what makes this such a fascinating story is the nature of the settlements at Tennant Creek. Established during the building of the Overland Telegraph in the 1870s, it is relatively remote, 500 km north of Alice Springs and 1000 south of Darwin, with little in the way of European settlement nearby. In 2001, approximately a third of the town’s population of 3,000 was Indigenous. Thus, it shares traits of a white settler town and a remote Aboriginal community, largely Warumungu but with a Warlpiri, Alyawarr, and Kaytetye presence as well. Christen details the story of conflicting land claims on both sides and talks about the succession of “mobs” that have tried to manage them: miners, government bureaucrats, lawyers, and throughout, Aboriginal families. She looks at the roles the Central Land Council, ATSIC, the Giants Reef mining company, the Federal, Territory, and town governments, and the railway companies have played in Tennant Creek. Each of her six thematic chapters looks at a different aspect of Aboriginal business in the town: land claims; Aboriginal organizations; mining; railways; cultural transmission in an age of digital technology; and the Nyinkka Nyunyu Cultural Centre. The unifying theme that runs throughout these varied enterprises is announced in the book’s subtitle and treated in the first, preliminary chapter: the making of alliances. By focusing on the work, the business of negotiation, contestation, and compromise, Christen is able to chart a history of Warumungu agency in Tennant Creek, its ups and its downs, but above all its persistence. This is a story about how people engage with their country and with those others who have come to occupy it with them. In her portrait of the Warumungu, they are neither passive victims nor activists, but rather women and men engaged in the business of living, with all their aspirations, disappointments, conflicts, and solutions. That is not to say that Christen does not fully acknowledge the disadvantage under which the Warumungu labor. In the early chapters of the book she skillfully weaves together two narratives. The first is of the original dispossession as first the Overland Telegraph and then the gold mines brought waves of outsiders to the Barkly, intent upon taking over the land and pushing aside the Indigenous populace. The second is the effects of government policy in the last thirty years, culminating in Howard’s Intervention. The philosophy of the Howard Government, with its emphasis on “practical reconciliation” and the “mainstreaming” of Aboriginal affairs into a broader Australian nation, stands as a metaphor for the logic of whitefella business that operates to exclude Aboriginal participation and agency. In contrast, and perhaps to a degree in consequence, “Aboriginal business” has come to focus on the work of forging alliances, of harnessing willing partners and forcing unwilling collaborators into arrangements that provide options and choice for the Warumungu and allow them to assert their own position in the management of their lives and their country. The historical sweep of Christen’s narrative shows how these strategies have changed over time, all the while remaining focused on retaining control. Christen deftly skewers the gazetting of country around Tennant Creek, describing how the map making and marking of early white settlers was irrelevant to the Warumungu who remained as ignorant of the “power” of such pronouncements as the settlers were of the marking of country by the Dreaming tracks of the Warumungu ancestors. She demonstrates how in later years the Warumungu exploited the resources of missions and cattle stations and made those settlements the locus of their own social interactions: how the business of alliance-making among Aboriginal families was made necassary by whitefella settlement and at the same time forced negotiations between Aboriginal and settler. The choices are not endless (p. 144, emphasis in the original). The blunt set of options outlined by the CLC, with its pragmatic conclusion, “make an agreement,” sums up the story of recent Warumungu history as presented in Aboriginal Business. The chapter on the completion of the Darwin-to-Alice leg of the transcontinental railway offers an example of ways in which alliances work two ways. Working with representatives from ADrail, Warumungu people helped to chart a course for the laying of track through their country and to identify resources (like gravel) that would be required by the rail company to complete the portions of the track that ran through country around Tennant Creek. These exploratory journeys also facilitated the Warumungu’s ability to care for country by providing transportation out to country that would otherwise be difficult to visit while at the same time introducing that country to the railway’s officers. The naming of two locomotives the Purnu (which appropriately means “carrier”) and the Aboriginal Stockman added the element of “symbolic” reconciliation to the practical business of building a railroad, thus acknowledging the importance of recognizing Indigenous history in a way that John Howard was at the time vociferously denying. The names, one in Warumungu and one in English, acknowledge pre- and post-contact history, and so comprehend both Dreaming tracks and track of cast steel. The community of responsible Warumungu leaders brought their territorial knowledge to bear on this project in a way that married ancestral need with contemporary economic goals. … Taking railway workers out to sites of significance and negotiating the benefits for their own communities, these Warumungu leaders situated country obligations in a new constellation of responsibility, in which railway officials and construction companies became secondary agents in the oversight and care of Aboriginal country. Defining aspects of their country for the railway companies meant inviting them to see the land and their partnerships differently. It also gave the Warumungu people a change to conduct their own country business (p. 181). These are but a few examples drawn from the riches of Christen’s book to illustrate the ways in which Tennant Creek’s Aboriginal people conduct their business both within their own communities and with the larger Australian state. Through them, she effectively and marvelously obliterates the tension between continuity and change, between tradition and modernity. For the Warumungu, there is no choice between living in the past and living with the modern state; there is only the option of living. Although Christen’s work has been ongoing and this book itself been in preparation for several years now, its appearance at this moment seems particularly timely in the wake of the July 2 release of Overcoming Indigenous Disadvantage: Key Indicators 2009, which has been the subject of much media commentary this month. For example, Fred Chaney was quoted in The Australian recently as saying, “The really important thing is to get permanent gains, not to waste the money. Those permanent gains will be best obtained if the Aboriginal people are strongly involved … and that takes time. … I would like to see more attention being paid not to speed of action, but on the effectiveness of action (“Engage Aborigines to solve race problems, Rudd urged,” July 11, 2009). Christen’s book demonstrates the wisdom of following Chaney’s advice. Just this week, Nicolas Rothwell praised the upsurge in local, grass-roots organizations that are wresting solutions from the welfare-era government bureaucracies (“The local road to recovery,” The Australian, July 18, 2009). Christen’s work shows rather how those old bureaucracies made possible new local solutions by providing a model for local organization; it also demonstrates that such local initiatives are anything but new. Aboriginal Business offers welcome and timely insights into both historical issues and contemporary social concerns. Encompassing government, law, the arts, and industry, it likewise provides an appreciation of the sweep of concerns the Warumungu are acting upon. In her synthesis of the diachronic and the synchronic perspectives on life in this corner of the Barkly Tableland, Kim Christen offers an analysis that is at once timely and timeless. For another look at Aboriginal Business in Tennant Creek, check out Christen’s photos of the book launch there last Monday on Flickr. Postscript: Kim has just written an eloquent, moving, and heartfelt post on the book launch and its effect on her and the people of Tennant Creek on her blog, Long Road . It says far more than I ever could about what this book truly means. This entry was posted in Anthropology, Books, Communities and tagged Kim Christen, Tennant Creek. Bookmark the permalink.